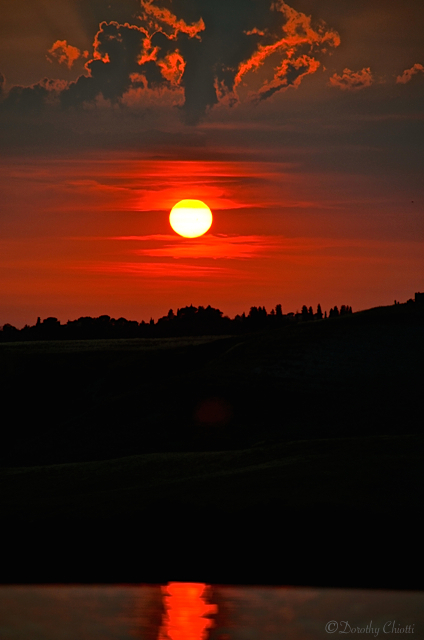 A fiery sunset in the beautiful Tuscan Hills of Italy. A throwback in time to a Tuscan sunset where earth, air, water, and fire conspired to take my breath away. On this first day of spring a look at the dancing light of winter. I am inspired by Nature in all its glory, and have chosen a Tuscan sunset to symbolize this. Our two-week vacation in Tuscany last year inspired me to wellness. Every time I revisit any of the hundreds of images I captured during our stay, my spirit is transported back to that beautiful place and I relive how incredible it made me feel to be there. Italy changed me; helped me to feel whole. It lives in me even now.